1. In a saucepan, bring the water and flax seeds to a boil. Reduce the heat and simmer for 30 minutes. Strain immediately, collecting the goopy liquid and separating it from the seeds. Let cool slightly, then refrigerate until lukewarm. 1. With the rack in the middle position, preheat the oven to 180°C (350°F). Line the bottom of a 20-cm (8-inch) springform pan with parchment paper. 2. In a bowl, combine the flour, baking powder and salt. Set aside. 3. In another bowl, beat the sugar, cocoa powder, oil and vinegar with an electric mixer for about 3 minutes. Add the egg substitute and beat until smooth. Add the dry ingredients, alternating with the soy beverage and vanilla. 4. Pour the batter into the cake pan. Bake until a toothpick inserted in the centre comes out clean, about 55 minutes. 5. Let cool slightly. Unmould and let cool on a cake rack. 1. Put the chocolate in a bowl. Set aside. 2. In a saucepan, bring the soy beverage and corn syrup to a boil. Pour over the chocolate in the bowl. Let sit for 1 minute while the chocolate melts. 3. Whisk the chocolate mixture until smooth. Cover and refrigerate until the ganache is cold but still spreadable, about 1 hour. If necessary, soften by warming briefly in a microwave oven. 1. Cut the cake horizontally in two. 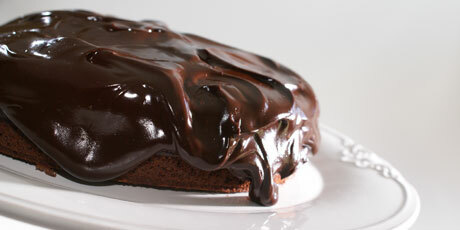 Ice the middle and outside with the ganache. 2. Note: Pour the remaining egg substitute into ice-cube trays and freeze: 1 cube is equivalent to 1 egg.